THIS REGISTRATION IS FOR THE MARATHON TEAM RELAY ONLY. IF YOU WANT TO REGISTER FOR THE INDIVIDUAL MARATHON OR HALF MARATHON PLEASE RETURN TO THE RACE WEBSITE AND SELECT THE OTHER REGISTRATION OPTION. NOTE IF YOU REGISTER AFTER AUGUST 22 YOU WILL NOT GET A RACE SHIRT! Scenic course introduced in 2015 taking in Bowring Park, downtown St John's and Quidi Vidi Lake! Each "Marathon Team Relay" member must indicate which leg of the race they will be running by selecting either Leg 1, Leg 2, Leg 3 or Leg 4 from the "Event" dropdown box on the registration page. All legs are 10-11k. In the box asking for your "Team" please enter your unique, creative "Relay Team Name". 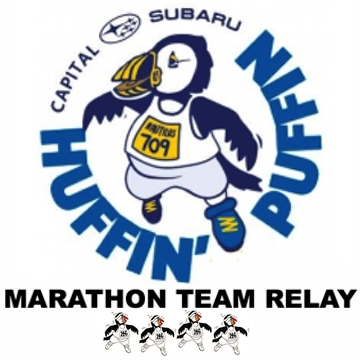 Please be sure that the same IDENTICAL "Relay Team Name" is used for all 4 runners on your team.